For the last three years, I, Ben Gadd (of no relation to the Ben Gadd), have participated in Go Wild!, hiking for six days into the middle of nowhere and out the other side, accompanied by complete strangers—and Dave Quinn. 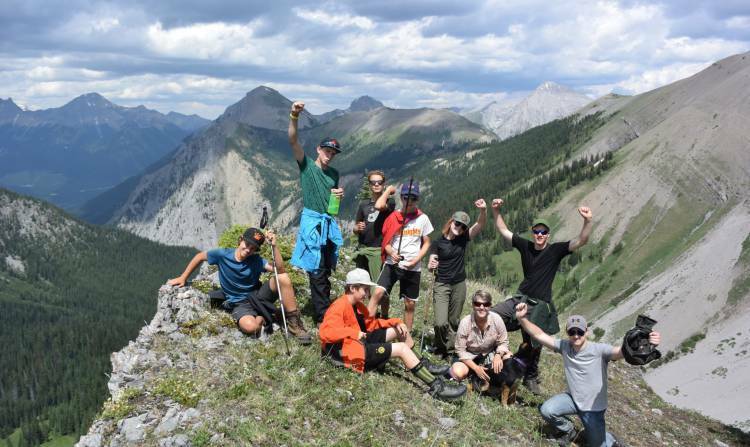 The first year, in 2015, a group of 14 teens, ranging in age from 14 (me) to 18, set out to hike the Earl Grey Pass hike, first mapped by Governor General Earl Grey more than 100 years ago. This was my first backcountry experience, and I loved it. Last year, Go Wild! was a mostly new group of 14 people, with three of us coming back for a second go around. We hiked through Elk Lakes and Height of the Rockies Provincial Parks via Pass in the Clouds, an incredible hike up and over a rocky pass, passing by three alpine lakes and stunning views the entire time. This July, a group of eight kids and two guides hiked the Hornaday Pass trail, with a stop at Goat Pass for two nights. On the Hornaday Pass trip, three main things stand out for me. First, summiting Bird Mountain, where we recreated an iconic 1905 photo of William Hornaday and his guide pointing across Goat Pass at the mountains beyond. From the summit, we could see the impact of humans: logging roads sliced through the landscape with cut blocks rising up around the Elk River and the smoky haze from the Interior’s wildfires was everywhere. Looking to the other side, we could see the beautiful glaciated valley where few humans ever travel. After summiting Bird Mountain, we decided to hike down to a lake that we had seen the day before from a lower peak. This lake was very secluded, protected on three sides by mountains and on the fourth open to the aforementioned glacier valley. As it was unnamed on the topo maps, we decided to name it Lake Merlot, in honour of one of our group who had been pushing to get to a lake since day one of the hike. Going to Lake Merlot was a group decision, well worth the deviation from Dave’s original plan. On the hike down to the lake, we crossed shale fields full of purple penstemen flowers and paintbrush more vivid than any of us had ever seen before. The third moment that stands out most for me was ridge walking up behind Goat Pass. Four of us went, including Dave, and from the ridge we could see into the next bowl, down to our camp and up to the top of Bird Mountain. At the top, the ridge was less than a meter wide, but in the low spots it was over 50 meters wide and looked like it had been landscaped with terraces and small grouping of stunted alpine greenery. From the ridge, we could also see over to a larger lake in Boivin Creek and spotted a golden eagle. For the past three years, Go Wild! backcountry trips have been journeys that I otherwise would not be able to do. My goal is to become more familiar with the Kootenay backcountry trails and improve my backcountry camping skills. I plan to use this knowledge to take friends and family into the backcountry— and to come back to Go Wild! next year! Feeling inspired? We still have a few spots left for the Go Wild! Purcell Mountain adventure at the end of August. Wildsight acknowledges the financial support of the Province of British Columbia for Go Wild!